There are times when one wonders what was going through the minds of Asimov and his coeditors as he put some of these innumerable anthologies together, or did they throw them all together so quickly that there really wasn’t much thought at all? The problem here is that this is ostensibly a fantasy anthology. (It’s number 5 in “Isaac Asimov’s Magical Worlds of Fantasy,” after all.) And so what do we have? Henry Hasse’s “He Who Shrank,” which we last met in Before the Golden Age and which is decidedly sf. Fred Pohl’s “Small Lords,” which is sf. Murray Leinster’s “Mad Planet,” which is sf. Asimov’s own (wonderfully delightful) “Dreamworld,” which is not strictly either sf or fantasy but leans more to the sf side of the fence. Damon Knight’s “Cabin Boy,” which is sf. By and large, these aren’t bad stories, although personally I don’t care for “He Who Shrank.” One nonetheless wonders what the heck they‘re doing in a fantasy anthology? 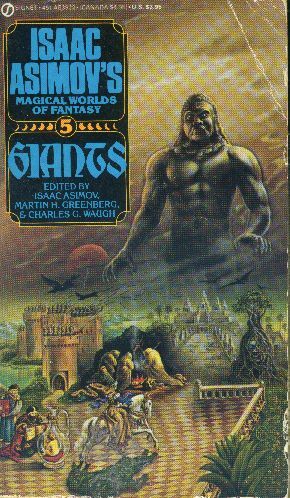 Even some of the fantasy stories are rather mixed up, such as Manly Wade Wellman’s “Straggler From Atlantis.” This is a story I’m not predisposed towards, having met its hero already in Wizards and having an enormous prejudice against any story about Atlantis (hence my dislike for the book Atlantis). Here, however, we have a combination of Atlantis stories, pagan myths, Biblical myths, and extraterrestrials stranded on the Earth. What the heck kind of story is this? Some of the stories are very fantasy and very good, particularly Ted Sturgeon’s retelling of the Balder myth. It isn’t enough, however, to overcome the chimerical nature of this anthology and make it really worthwhile.